ENABLE-IT ETHERNET & POE EXTENDERS SUBMERGE TO NEW DEPTHS WITH UNDERWATER ROVS! Over the years, MiniROV manufacturers have soundly overcome the significant challenges faced when deploying these smaller, nimbler ROVs in deeper, offshore ocean applications. In the process, they have advanced operation capabilities with innovative technologies. Vortex generators, for example, now allow MiniROVs to firmly attach to and crawl around structures deep below the ocean sea-level. Thus, saving operators from always having to employ diving teams for tasks like surveys. Similarly, long distance, low-drag tethering, has been greatly enhanced thanks to Enable-IT, Inc. PoE and Ethernet extenders. MiniROVs were initially designed for shallow water applications, simply because there were a number of challenges that needed to be met before they could operate at ocean depths greater than 1,000 meters. These included the miniaturization of control electronics, the design of lighter weight pressure housings, power and data transmission over very long cable/tether/umbilical lengths, and more. 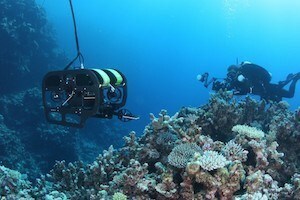 Over the past decade, the ROV industry has managed to overcome these challenges, effectively helping MiniROVs emulate the capabilities of much larger systems. Additionally, some MiniROV manufacturers have developed previously unthought-of technologies that have proven to be uniquely useful to offshore ocean applications. Now however, largely thanks to PoE and Ethernet extension technology, the cross-section of tethers has thinned to just 8.99 mm, considerably thinner than traditional ROV tethers, which average at least 20mm. Once Enable-IT, Inc., inventors of Ethernet extension technology, were able to miniaturize deep sea-worthy Ethernet extenders, MiniROV manufacturers have been able to multiplex their transmissions –and send Power over Ethernet (or “PoE”)- to MiniROVs using just 1-2 pair of standard copper wiring. Furthermore, these Ethernet extenders seamlessly drive this data and power several thousands of feet, well past Ethernet’s distance limit of just 100 meters (328 feet) and with no bridging in between. This means significantly fewer wires and results in a very thin, all-copper tether with significantly less drag upon the MiniROV. This also means that these MiniROVs can often be lowered into the water by hand, without the need for expensive launching systems. Another highly useful advancement is that of non-magnetic vortex generators, when utilized as part of a “crawler” attachment, effectively grant MiniROVs the ability to crawl pipelines, hulls, and other structures in the ocean. Using an impeller, instead of magnets or thrusters, vortex generators create a low pressure pocket (i.e. venturi effect) beneath their crawling MiniROV, yielding up to 28kgf (62 lbf) of attractive force against any flat and hard surface. A system such as this holds several attractive benefits for its operators. For one, it yields so much attractive force that it maintains precise operations while a vessel is already in motion at sea or is experiencing strong currents while anchored. Therefore, this allows operators to survey their vessels more safely and economically than they would have by employing dive teams, particularly in more hostile ocean environments. It also means that cameras and other imaging equipment (e.g. imaging sonar) produce very high quality images and data because these devices are kept at a consistent distance from the target structure. Furthermore, with the increased stability, MiniROV operators can enjoy much less fatigue and the occasional choice to focus solely on incoming data. Previously, the technologies required for automated navigation, such as Doppler velocity logging, were too difficult to sufficiently miniaturize for MiniROV use. However, some operators would be pleasantly surprised to learn that automated navigation of MiniROVs has indeed become a reality within the past five years. Using a form of sonar tracking, MiniROVs are now able to lock onto a target and navigate by waypoint, hold a position, conduct a programmed search, and more. In fact, at least one MiniROV can reliably orbit around its locked-on target. The benefits of automated navigation are quite clear. The less operator effort the less they fatigue, thereby increasing their chances of successfully completing their other tasks, such as data monitoring. Additionally, to the degree that an application can be automated, such navigation logically holds the potential to save operators inordinate amounts of time and money. Due to their size, agility, and newfound capabilities, MiniROVs do well at rounding out the abilities of their larger brethren. Such was the case of FMC Technologies, a prominent oil and gas supply service company, and their need to cap three subsea manifolds which were missing small valve caps but were already installed. Oil production could not begin without these small caps, and the proposition of recovering three 160 ton manifolds to install these caps involved many millions of dollars. FMC naturally turned to ROVs to try and solve the problem but quickly realized that neither work-class nor observation-class ROVs could fit into the task’s tight operating space. FMC then turned to MiniROVs and decided upon an operation wherein a MiniROV would be outfitted with a special torque tool (to attach and tighten each cap). Then, due to the North Sea’s bad weather, FMC would use a work-class ROV to replace the MiniROV, which would be placed in a basket, close to each manifold and release its tether. Thereafter, the larger ROV was to provide support as the MiniROV got to work. And work it did. It turned out that the second and third manifolds already had temporary test caps attached to their relevant valves. So, the MiniROV had to remove this cap and be recovered every time before it could try again and attach the actual cap. On the second manifold, this was complicated by the fact that the WROV accidentally opened the MiniROV’s basket on the way up, but it was ultimately recovered quickly. By the third manifold, the operator attached a small mirror to the torque tool, so one could see the test cap better, and, after recovering the MiniROV and dropping it back down, he smoothly attached the final cap. In another example, MiniROVs proved to be uniquely suited for some applications. This is especially prevalent in applications that require crawling and/or attachment, such as the 2009 case of an Inspectahire survey of an oil rig’s legs in the Persian Gulf. Inspectahire, out of the UK, was tasked with surveying the legs of an oil rig that belonged to one of the world’s largest oil and gas exploration and production companies. As the rig experienced the Persian Gulf’s unforgiving thermally-induced tides, previous attempts to survey the rig’s legs by flying an observation class ROV down to them were unsuccessful. Inspectahire needed something new. Extend your power over Ethernet Extender beyond 100 feet. The 824WP goes 2,000 Ft and is the first weather proof sealed Ethernet Extender Made in USA by Enable-IT! Here is the Manual for this Revolutionary Technology 824WP Kit!